Apple’s forthcoming iPhone 8 launch event will already be chock-full of brand new products, if the wave of leaks and rumors is any indication, but what about that iMac Pro? You know, Apple’s insanely powerful all-in-one PC for professionals that was announced back during its WWDC 2017 show. Sure, we know already that it’s to launch this December, but knowing the exact date is kind of crucial at this point in the game – especially for those looking to pre-order one, say, during Black Friday or Cyber Monday. Plus, this would be a fine opportunity for Apple to tout exactly which types of 8-core, 10-core and 18-core (!!!) processors from Intel the device will use, not to mention the specific AMD Radeon Vega Pro graphics chips that the computer will feature. 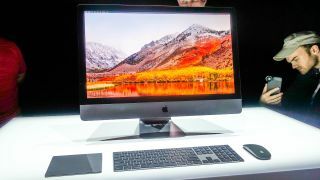 To really nail the perception that Apple is back to firing on all cylinders with all of its product lines, throwing in the exact ship date of its hotly-anticipated iMac sounds like a no-brainer. Surely, discerning Apple fans would like to know specifically which processor and graphics chip are inside their new Mac computer that costs, at the very least, $4,999 (£4,949, about AU$6,720). If Apple could throw the Mac crowd this little nugget while touting everything that’s great about the upcoming macOS High Sierra (which will almost surely get a release date), its diehard fans will feel that much more taken care of. Not to mention they’ll have a firm target to save their extra cash against.